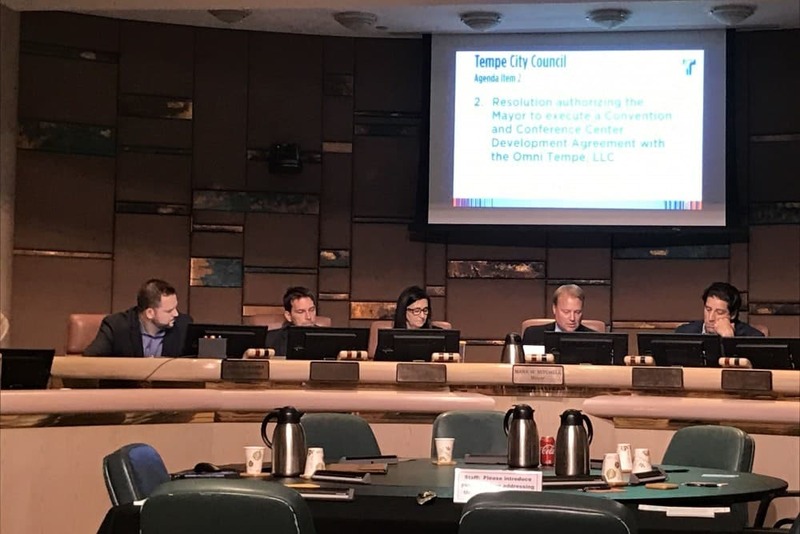 The Tempe City Council is scheduled to vote on Thursday that would decide whether to release details from its internal investigation into misconduct allegations leveled against Councilman Kolby Granville. Granville, a former teacher, was fired from Tempe Preparatory Academy in December 2017. The removal came after two former students alleged he gave them alcohol when they were under 21, and one said he made unwanted sexual advances. A third woman filed a complaint the next month, and alleged Granville made unwanted advances toward her shortly after she had graduated from Tempe Prep. He has never been charged, and he denied the claims. A Phoenix police investigation was initiated at Tempe’s request. But it was closed last March because the victims would not aid the prosecution, police said. The City Council hired an outside attorney for an investigation by a separate council code-of-conduct into the allegations after the police investigation was closed. A transcript of an interview conducted with Granville in January. Granville’s response to the investigative report. A reply to Granville’s response. Dan Barr, an attorney with the Arizona First Amendment Coalition, said the documents concerned were public records. However, the findings from the investigation are yet to be revealed. The council could do nothing, seek to censure him or seek to remove him. Tempe voters in November gave the City Council the power to oust a member for misconduct. It is still unclear if the new rules could be applied to Granville should that be warranted. Vice Mayor Lauren Kuby has previously said the approved city charter change could not be applied retroactively against him. If the investigation revealed new details about the allegations, it’s unclear if that could pressurize the council to pursue removal. Granville did not respond to requests for comment. Previously the council members could only be removed from office through a recall election, or if the city found that the official lacked any of the qualifications for office, violated the city charter, was convicted of a crime involving moral turpitude, or was absent from three consecutive regular council meetings without being excused. The charter change does not require the council member to be convicted of a crime to be removed. However, a council member can only be removed after an independent investigation, three public hearings and public input. Apart from the Thursday’s vote on the release of the documents, the council could discuss the investigative report and its next steps as soon as the March 21 work-study session, as per a spokeswoman. It should be noted that Granville is in his second term, which runs through 2020. He has previously stated in public that he doesn’t intend to seek re-election. The vote is indeed an important one as it would try to answer multiple questions like whether a measure can be used on retrospective matters; the seriousness the Council handles the case of teenage abuse with etc. Being a public figure, if he will be found convicted in the independent investigation, he should be given exemplary punishment to impose a sense of public scrutiny over the politicians, and this will lead to stopping of abuse of power. However, Councilman Kolby Granville should also be given proper space for stating his side of the story.